A Quickie Adventure - To Be An Orc! Gameplay Length 30 mins. - 1 hr. Alignments Chaotic, Neutral or Evil. Final Version (I hope)! You're a young orc warrior who has come of age. The chieftain summons you to his tent to announce to the clan that you will go through your initiation under the eye of the great orc god Gruumsh! To determine your worthiness to be a warrior of the great Dead Head Clan you must go to the nearby human village and terrorize it in as many ways as possible. Slay the humans in the name of the Great Dead Head Clan! We all spend so much time wanking on the orcs that I thought it would be fun to play the other side just for something different. 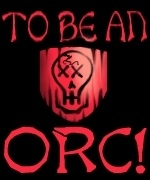 Hence, 'To Be An Orc!' This module is designed for a first level orc or half-orc character of any class, though warrior classes would be more appropriate here. You can certainly play a female orc or half-orc if you like, but the module is more oriented toward a male character. Remember that there is NO RESPAWNING in this module. So save often! Enjoy. I find this to be too offensive.